What a marvellously creative and joyous three days I had working with the Anjali dancers at The Mill Arts Centre in Banbury. My role is to support the dancers’ development and their personal professional skills as dance teachers and dance facilitators; also to develop workshop content and approaches to delivering dance in all sorts of educational and community settings. I arrived with a pretty clear idea of how to approach the work, starting with the individual, who they are, what they bring, their body and mind and what they can do – finding their strengths. I also wanted to find out what they enjoy doing and what they know already, where they lack confidence and how we can work on building confidence together. We are just beginning to find all these things out! What I instantly discovered was how experienced these dancers are – WOW. They have amassed a lot of knowledge and experience, having worked with some of the most experienced and innovative choreographers and teachers in the country. They are now ready to share their knowledge and skills with others to inspire, motivate and get as many people engaging in high-quality dance activity as possible. The dancers needed no encouragement to take responsibility in their own learning – they are fully empowered to do this for themselves. What I witnessed was a willingness to learn, listen, ask questions, write, remember, play, lead small chunks of creative ideas and tasks, learn about improving voice projection, gain greater confidence, practise giving positive feedback and create together. I am taking a simple approach: how might you lead a warm-up, introduce a creative task during a workshop, work with safe contact, develop choreography using imagery as stimulus, for example. 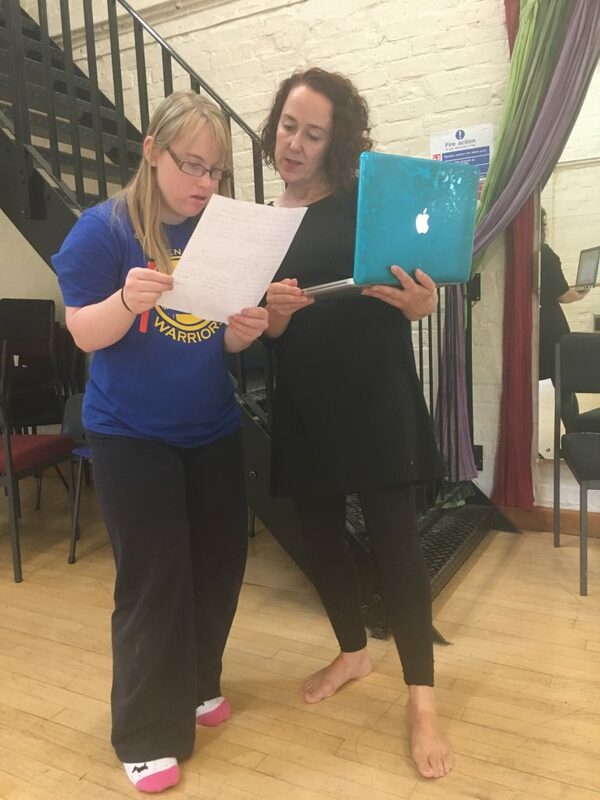 Most importantly, we are identifying together what type of environment and what support systems the dancers need as individuals, enabling them to prosper as individuals and dance leaders. During the past few days a picture has begun to emerge of what roles individual dancers might take during educational workshops. Facilitating Anjali’s evening open class on Monday evening also enabled me to observe the dancers in action and see where they shone and what areas needed improvement. Daisy is very focused and hungry to learn as dance education leader. Hannah has the ability to explain ideas clearly and demonstrate with clarity. Jason makes beautifully sensitive work as a support dancer, as I witnessed in Anjali’s open class on Monday night. Alex has a sensitive and inclusive approach to engaging everyone in the room. Nick has the ability to think on his feet, change the plan and make things fun. Lauren’s strength is in engaging wholeheartedly in an idea and encouraging others to do the same. We are taking our time and finding simple and supportive structures in the studio to allow each individual to learn, practise and enjoy the process. I’m looking forward to the next time we meet in just over one week’s time. I’ll keep you posted on developments!